Are Grab's Commute Plans worth it? We did the math and found out. Ride-hailing apps are making getting around Singapore easier than ever before. But it can get crazy expensive, especially during peak hours. So when Grab launched their monthly subscription programme last month, I was intrigued. The subscription plans are tiered to suit each individual's needs and can be used for food, transport, or both. But how much can you actually save? Sometime in late January, with a busy week ahead of me, I signed up for the Grab's Commute Plan (Lite), which costs $19/month for 10x $4 vouchers. The Commute Plans are valid for a month, giving you ample time to use up the vouchers. I went with the Lite plan as many of my weekday trips are short and during off-peak hours. What I didn't expect was to use half of my 10 vouchers in the first two days! Here's how I used the plan during that week. In my breakdown the cost of my trips and my total savings for the day, I factored in the cost of each voucher as $1.90 per $4 voucher. My day usually starts at 6.15am, an hour before my weekday morning yoga class at 7.15am. Unfortunately, Monday mornings are hardest to manage, so I ended up hitting the snooze button for half an hour before I finally rolled out of bed. The train ride from my home to Telok Ayer takes around half an hour, so to make it to my class, I decide to book a Grab. Luckily, traffic was light. I reached in time to awkwardly stumble into the first sun salutation, narrowly avoiding the $10 penalty of missing class. The yoga teacher gave me a knowing look. We had an event on Wednesday to prepare for, so I made a trip to Bras Basar Complex to pick up some supplies. Weighed down with heavy bags, I took a Grab back to the office. It's a hot day, and I'm happy to avoid carrying heavy things in the sun. The ride only cost $8, but with the $4 voucher, I shaved 50 per cent off my fare. I even have a pleasant conversation with the driver, who used to be a TV host. He tells me about his family and his stint in show business, and I tell him a little about the work I do. The conversation makes the mundane trip more bearable. The errand only took me 30 minutes, and I get back in time to have lunch with my colleagues. On the second day of my commute plan, I had a work meeting at 3pm at Clarke Quay. The journey from the office isn't long, but the awkward timing in the middle of the afternoon eats up my most productive time of day. To save some time, I decide to Grab there and back. Thankfully, it only costs $6 for the trip there and back, which means I only pay $2 per trip. I use my time in the car to answer emails on my phone. After a long day, and my colleagues and I head out for some after work drinks. The combination of the wine and good company puts me in a good mood, and at 8.30pm I decided to take a Grab and have an early night. The trip costs $13, my most expensive trip of the day, but it's the one I felt I needed the most. Traffic is smooth, and I almost doze off on the ride home. The original price for all my trips was $42, but I only paid $22. If I take the cost of the vouchers into account, I end up saving 25 per cent on Grab rides in 48 hours! But the savings don't stop at the Grab subscription plans. Because I am a Platinum member, I was awarded a new GrabRewards Stamp Card on Monday morning. The GrabRewards Stamp Card is only available for Platinum and Gold members. 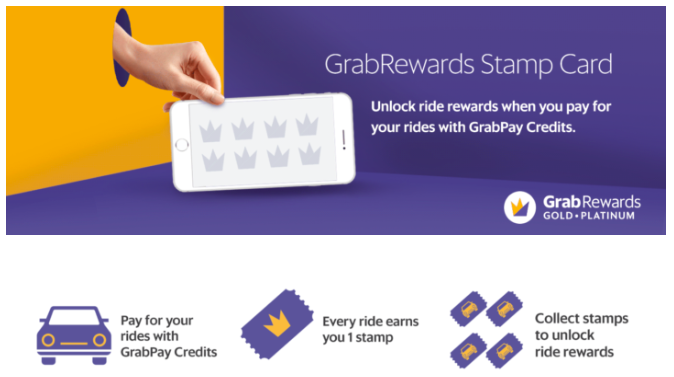 Paying for a ride with GrabPay credits earns users one stamp. Accumulating four stamps unlocks three $3 vouchers. With eight stamps, you can unlock three $5 vouchers. A new stamp card is awarded every Monday at 12.01am. When I paid for my fourth ride, I unlocked an additional three $3 vouchers. That means an additional $9 in savings, which more than makes up for the cost of those vouchers ($1.90 x 4 = $7.60). For the latest updates on GrabRewards Stamp Card, click here. What I did not anticipate was how quickly I used up the Grab subscription plan rides. Knowing I had vouchers stored in my app that I had to redeem within a month, the decision to always book a ride on Grab instead of taking public transport was so very tempting - it very quickly got me hooked. Over those two days, I very quickly learned the amazing compound effect of the Grab Commute Plan (Lite) and the Reward Card - the more you use, the more you save. In the end, I finished eight of the $4 vouchers within a week, so my total accumulated voucher amount for that week was $64, which far exceeds the cost of the $19 plan. Busy weeks don't happen all the time. But when time is precious, every minute you can spend getting things done and not on the road is valuable. It's good to know that even taking a Grab ride to work or meetings can save you money.